Before getting into craft beer, I had only a vague notion about what a hop was -- and I was clueless about how hops were processed, where they were grown, and whether or not they made you sleepy when you pick them (they do.) But all that changed at the Beer Bloggers Conference this weekend, when I got the dirt from a New York state hops farmer named Laura Ten Eyck. Box of Cascade hops at Vanish brewery in Virginia. 1) What we think of as a hop is the hop cone (think pine cone); these hang from very long vines. 2) The parts of the hop plant prized by brewers is the flavorful resins and oils inside the inner lupulin glands. 3) Hops are part of the Cannabinaceae family, making them kissing cousins with weed. 4) Pliny the Elder referred to hops as food. 5) Hops were prized in the middle ages for their antiseptic properties. 6) The colonists brought hops over from Europe; these plants crossed with the wild hops growing in America. 7) Hops grow straight up from the ground and can reach as high as about 30 feet, although farmers commonly train them at 18 feet. 8) Hops are grown in a hop yard. There are 1000 hop plants per acre. 9) Hops are trained on wires which are strung along tall wooden poles that resemble telephone poles. 10) Hops are perennials - farmers need to prep the soil before planting because they get one shot at it. 11) Hop plants need a lot of water. But hop roots hate to be wet, which is why the rainy 2018 summer on the east coast is hard on the crop. Hops struggling during a wet summer in Virginia. 12) Hop yards are plagued by weeds, downy mildew, and pests. After hops mature, then what? 13) Hops are harvested from mid-August to mid-September. 14) After harvest, hops are usually dried, often in kilns. 15) After drying, hops are pelletized and then can be shipped to breweries. 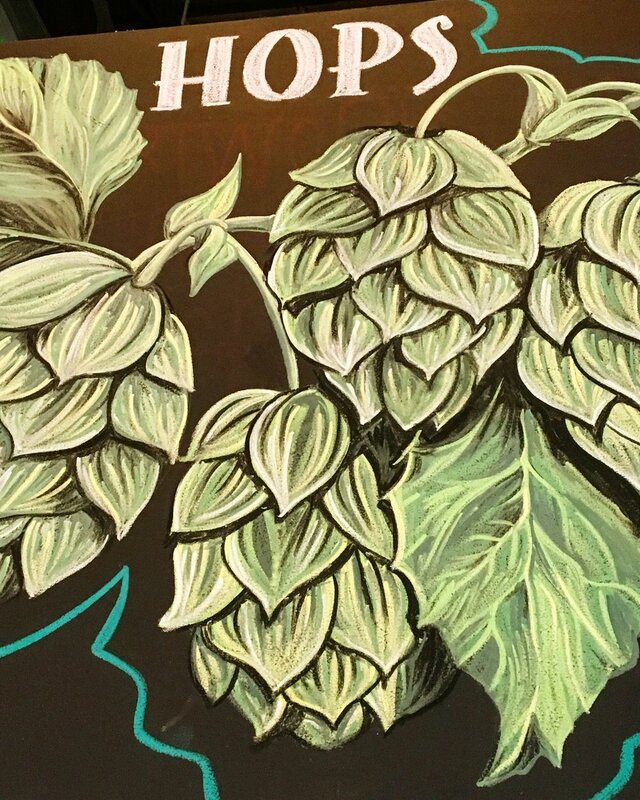 16) However, some brewers use freshly harvested hops in their beer, a process known as using "wet hops." 17) Hops are soporific - hand harvesting them makes you sleepy. 18) America's original wild hops plants can still be found, and some farmers are looking to grow them at quantities necessary for commercial brewing. 19) New York was once the number one state for hop growing, but now Yakima Valley in Washington state is the top-producing agricultural area for hops in the world. 20) The antibacterial properties of hops make beer last longer. That's why beer shipped to India had a tremendous amount of hops added to it - and that's where your Indian Pale Ale was born! For anyone interested in trying to grow their own hops, I recommend the book Laura and her husband wrote, The Hop Grower's Handbook.